The little ladies have a bath every evening after tea, at the moment they all go in the tub together. At least 4 nights a week I do bath time on my own so we have a system in place to ensure minimal chaos. 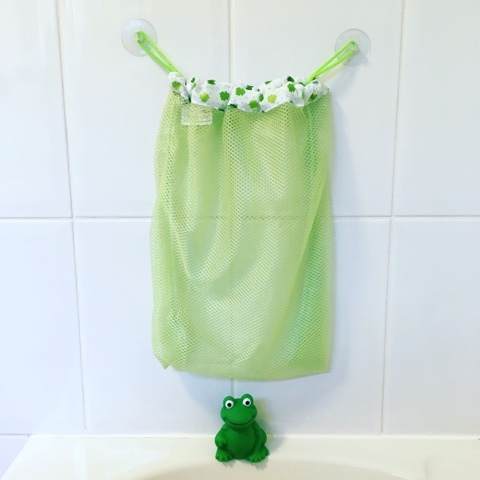 I thought I'd share some of the things that keep us organised so everything is easily to hand and keep our bathroom child friendly with a little bit of help from the Froggie collection from Mommy's Helper. The girls absolutely love bath time, they would spend hours in there if they could, in fact I often top up the bath with more warm water so they can stay in just a bit longer. 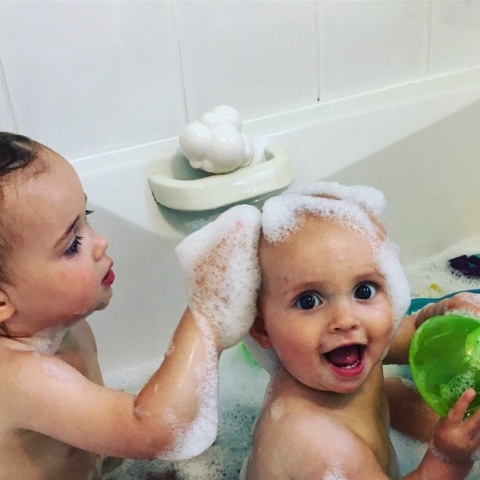 For this reason we have a lot of bath toys, the girls are in their element pouring water and playing with the little characters we have, making bubble cakes and splashing each other... and me. 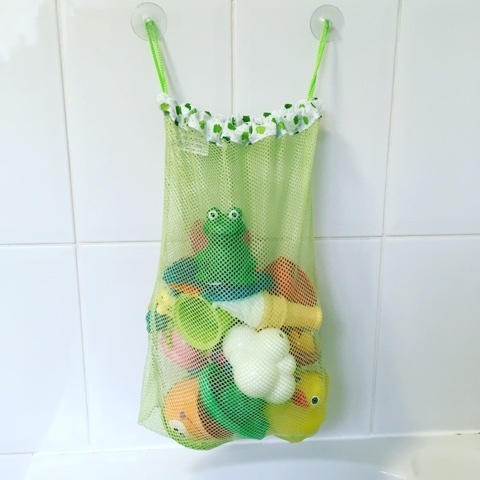 This Tidy Tub Toy Bag is brilliant, bright and cheerful it sticks to tiles or any other smooth flat surface using suction cups. It's a good size 14'' x 15'' so comfortably houses all our bath toys. I love that it's mildew resistant too which can be a problem in bathrooms, it's also machine washable which is great. It comes with a lovely little frog bath toy too which I thought was a really nice touch. It's easy to get the toys in and out which is important when there are 3 little ladies scrabbling around to find their favourites and for me when it comes to scooping them all up and tidying them away when bath time has finished. Miss Tibs and Miss Boo take much delight in sliding around in the tub but Miss Dot still needs a bathmat. The Mommy's Helper Froggie Bathmat rather handily only takes up a third of our bath so it's great just for putting at one end for her. It's a really fun design made from soft rubber for comfort on sensitive little bottoms. 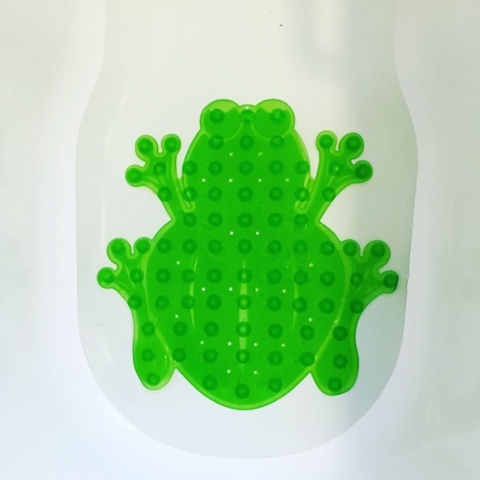 It has suction pads on the reverse to hold it in place and is non slip keeping Miss Dot safely sat upright when she's in the bath. One of Miss Dot's favourite things to do in the world is clean her teeth, I'm not joking! Straight after her bath she points and shouts to her toothbrush. Miss Boo and Miss Tib's are a little less keen on teeth cleaning and take quite a bit of convincing. 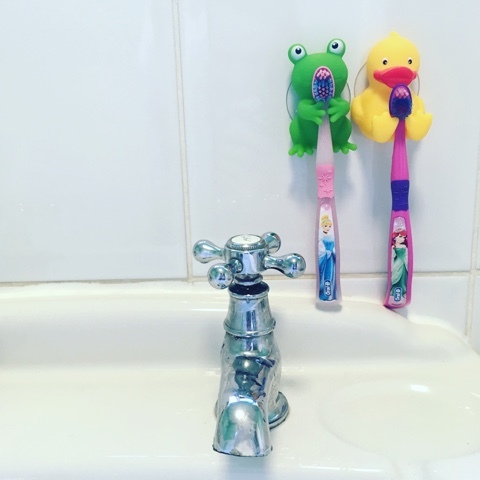 They do however love getting their toothbrushes from their Mommys Helper Frog and Duck Toothbrush Holders and putting them back again. We used to have a lovely ceramic pot of all our toothbrushes but it was knocked off the side in haste and broke all over the bathroom floor which wasn't ideal so these are a much better alternative. I think they are really fun and if it helps encourage the girls to clean their teeth then even better. They'd actually make a cute little stocking filler. At some point during bath time someone inevitably needs to get out to go to the toilet, I do try to get them to go before they get in but you know how it goes! 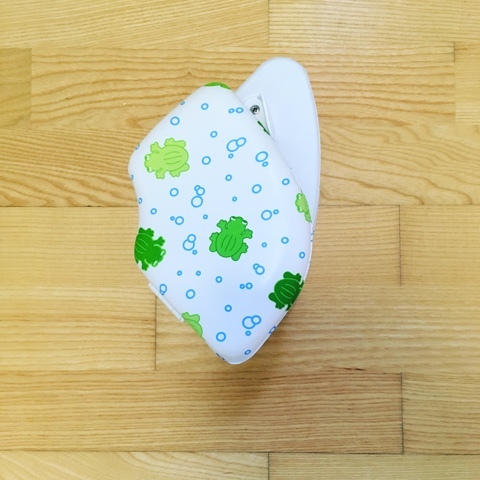 I really like this Froggie Traveller Potty Seat. 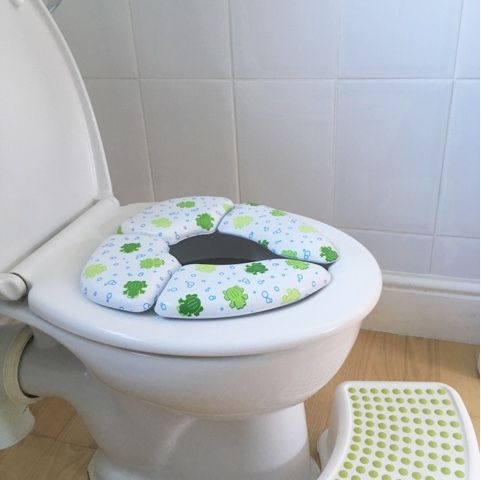 It's padded and thickly cushioned for comfort and safety and fits standard and most elongated toilet seats. The underside has brackets to stop it from sliding so it stays in place well. It's easy to wipe down and keep clean too, something you'll know is important if you've used anything like it before. If not add it to your potty training essentials. I also like that it folds up and is very compact. It comes with a handy bag which is washable so you can take it out and about with you. It's great for travelling with; we recently took it on holiday with us and also take it if we're heading out somewhere for the day to save having to balance a toddler on a loo seat. The froggy design makes it appealing to the girls and they are keen to sit on it. Once the girls are all clean and splashed out we get out the bath and ready for bed with everything all tidied away and ready for the next day of bath time fun. I like these products because they make life easier for me, they are bright and cheerful, look great and all co-ordinate and really help make our bathroom child friendly. If you would like to make your bathroom more child friendly all these Mommy's Helper products are available on Amazon and are distributed by Ardega Nursery Distribution. Wishing you a happy, splashy bath time. *This is a sponsored post in collaboration with Ardega Nursery Ltd. I was also sent the Mommy's Helper products for the purpose of this review.